BARGAIN DECORATING WITH LAURIE: WHERE IS MY BRAIN? I have been in Blogville for about 16 months, and I have never participated in Rednesday sponsored by Sue at It's a Very Cherry World! As much red as I have in my house, I am shocked that I haven't participated in all of this fun. I don't know what I've been thinking, but my brain finally kicked in, and today I am participating! and the mug with a parade of red animals encircling it. Although this bowl and mug look like Pyrex, they have no markings on the bottom. I am also showing you my rooster juice glasses (just because they are red and are in the same cabinet with the mug and bowl!). I love my vintage apple shelf paper given to me by my friend, Charlie Ann. Lots of lovlies there Laurie, but I would really love to get my hands on a set of those rooster glasses! Your grandkids must have a blast at Grandma's house! A firetruck ride. In the house! My favorite red though is the rooster juice glassed, because I have them too! They were my Grandma's, and I remember having my orange juice in one every morning when we were visiting! I've had something I've been meaning to post for Rednesday for the past couple of weeks and it just keeps slipping up on me. 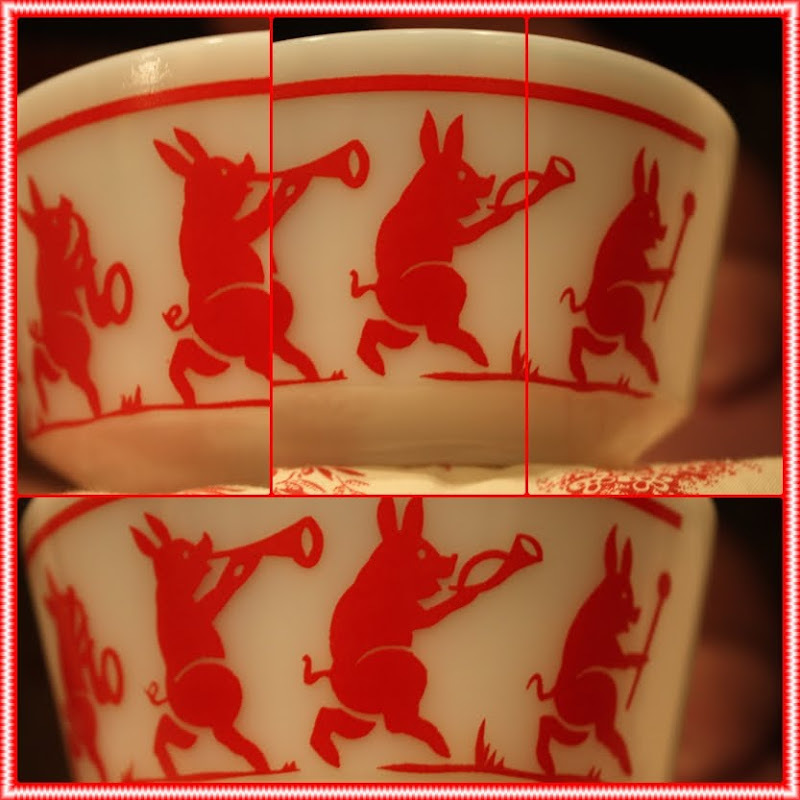 I do just love, love, love that parade of red pigs. Interesting, this is the first I've seen. Nice pictures. I love all your red, especially that fire truck ride. How many gramma's have a ride at their house like that? Why, Laurie, what a pleasant surprise! I'm so glad you joined us today because I love all your stuff, and now I get to see your red stuff, too! Parading pigs? I'll believe that when I see them fly! I'm coming over for a ride - will bring my own quarter! LOL! I can not believe how many treasures you have in your house. It's always a joy to visit your blog to see what else you have to share. That is some sweet red you're showing there! Thanks for sharing. 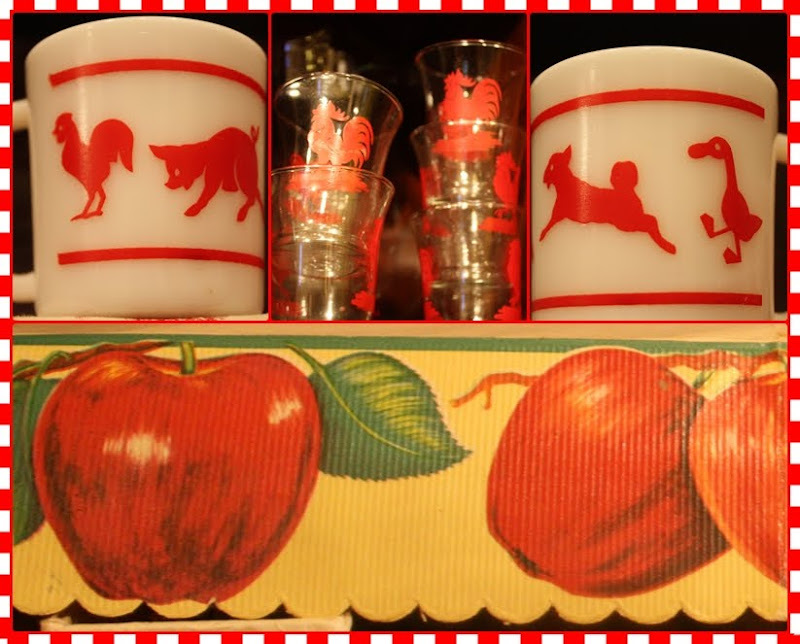 I used to have some little red rooster juice glasses just like those, and small hands somehow broke them all. Wish I still had some. I love your little dancing pigs. CUTE! Your grandkids must be the only ones in the world with a grandma who has a ride at her house! How lucky. Laurie, I LOVE your REDS!! You must have the most FUN place for your grandkids to come visit. I know I would love it. Oh, goodie! I get to polish silver and ride that fire truck if I visit! So happy you shared these darling dishes. I'm amazed at all the treasure that live in your home. And yes, I'll put the button on my sidebar. Meant to do that earlier. Thanks for the reminder. Looking forward to the party! What pretty reds Laurie. My goodness I bet your grandkids love to come and visit you. Shh, don't tell mine what you've bought yours! Are you ready for this blast of cold, snow, ice and rain? Not me that's for sure. I adore these precious little children's dishes you have! Where do you ever find them? What cute dishes. They make me want to march around the kitchen! When I first looked at the fire engine I thouught it was a cookie jar on a counter! LOL! I think it's great that you brought it home. It's something your grandkids will never forget. Great looking red post, Laurie! 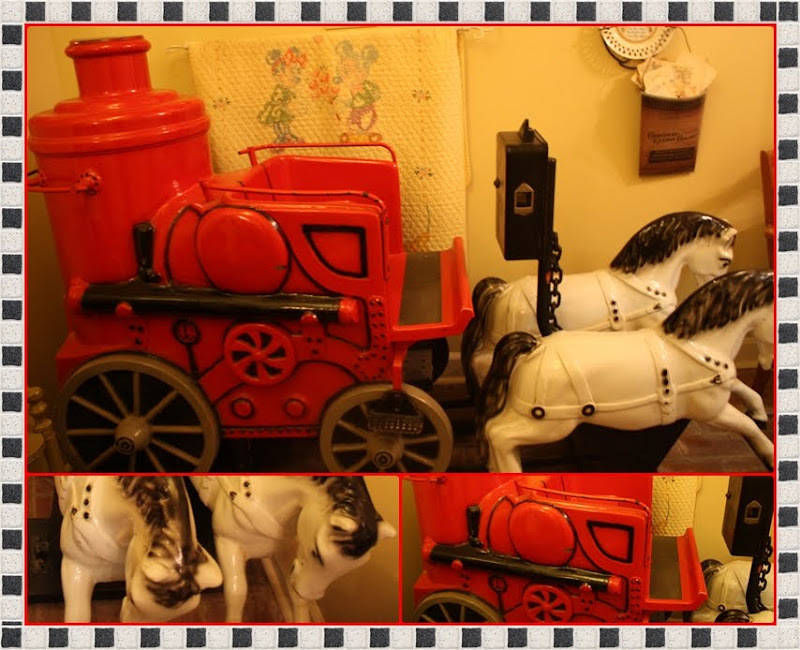 How fun to have that ride in your home- I want one like that when I get to be a grams- so fun!! All your reds are great ! Wow, The Fire truck ride is such a fun thing , your grand kids must really love visiting ! looking forward to the valentine party. 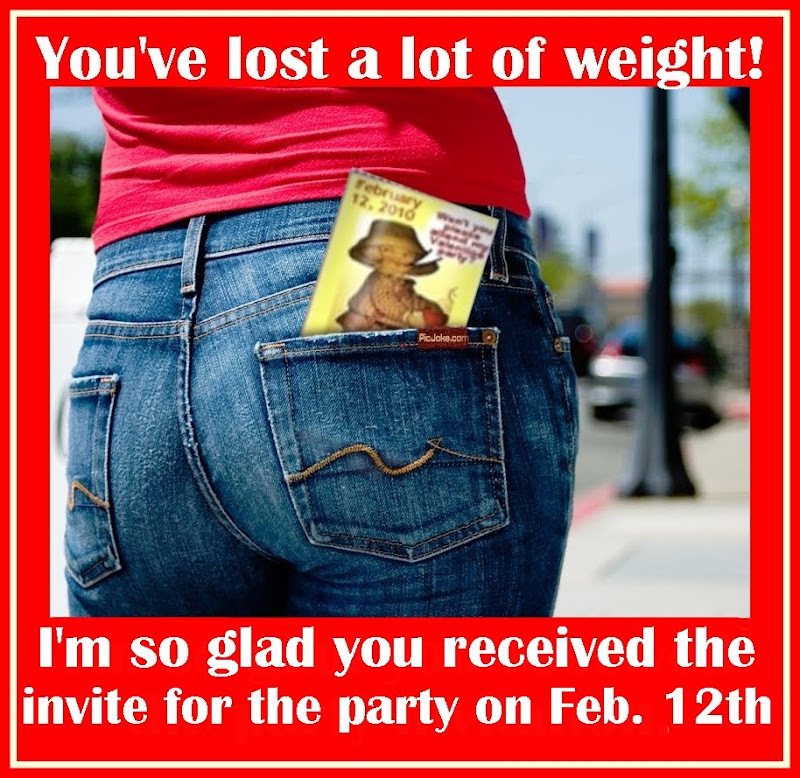 Love the invite to the Valentine Party in the back pocket of those jeans!! Your red goodies are fun!